Enjoy a water half day tour from salt water to fresh water that. Begin the day with snorkeling at Hanauma bay with included snorkel gear. Hanauma bay offers a pristine marine ecosystem and has been one of the Island of Oahu's jewels. Enjoy a sightseeing tour along the way to Kailua / Lanikai beach. A quick stop at blow hole and Eternity beach. End the tour with a short hike through rainforest to Pali falls. Pick you up at the hotel. 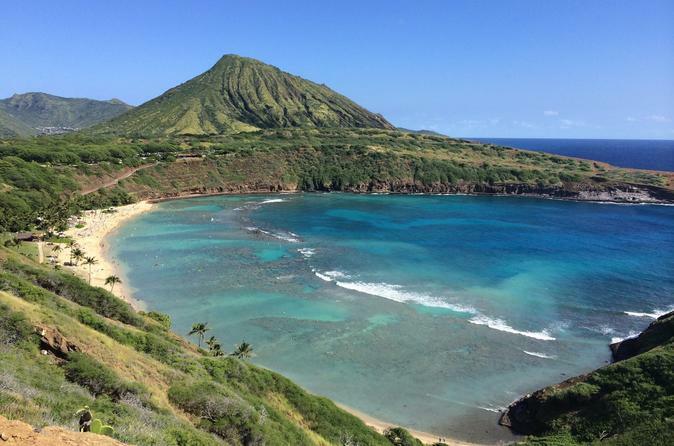 Start your day with snorkeling at Hanauma bay for 3 hours with snorkel gear we provide and then continue driving through the beautiful scenery of Oahu's windward Side. We'll make a quick stop at a famous blowhole lookout and Eternity beach before continuing our sightseeing tour past Rabbit island, Makapu'u Lighthouse, Sandy Beach, Sea Life Park and Waimanolo Beach. Spend one hour swimming at Kailua / Lanikai beach and then continue drive to a short beautiful hike to Pali Falls. We recommend wearing water shoes. ($5 rental) Sometime it can be very muddy trail. The trail is suitable for all ages. Return to Waikiki.